How Social Media Can Help You Avoid the Summer Slowdown. Turn the social media summer slowdown into a warm weather win. Admit it: when the sun is shining and the weather is warm, the last thing you want to think about is social media or marketing in general. This may also be true of your customers. Summer months usually usher in with them a slowdown in traffic and engagement on major social channels as people take vacations. This is especially true in Europe, where vacations are longer and many companies even shut their doors over the middle summer weeks. During this period, there are several strategies your brand can take to turn the social media summer slowdown to a warm weather win. Saving the best for last is an appropriate motto for a dessert menu. When it comes to content, you should look to what performed best during busier parts of the year and repurpose for the slower summer months. There’s little risk involved when you create another asset inspired by an already popular piece of content. Creating most pieces of content is often a multi-person effort. You may not have the necessary manpower to create imagery, SEO research or copy editing during popular months when more people are taking vacations. You should also consider repurposing a piece of content that hasn’t performed well with some tweaks based on things you’ve learned since it was initially posted. For example, a low-performing long-form blog post might be better received as an infographic. Alternately, consider adding a summer twist to content. Last Halloween, Falcon.io added a spirited twist to our Social Media Crisis Handbook by adding a seasonal color palate and spooky copy on social. When you’re busy it’s easy to fall into the trap of just trying to keep your head above water long enough to maintain the status quo. It can also be daunting to consider implementing a new tool, there’s the learning curve, the adoption process and just not having the time to do either. However, the benefits of using a social media management tool far outweigh the comparatively little effort needed for adoption. 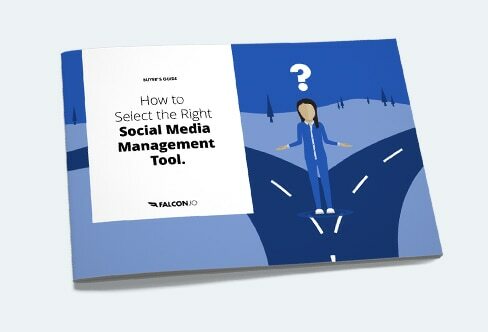 A social media audit enables you to take stock of your organization’s social performance and helps you plan how to develop and improve it for the future. There’s no better time to dedicate yourself to reviewing your performance than when you are not focused on meeting the demands of an active social community. By laying out all the data it provides a unique opportunity to gauge and improve upon your social strategy. Both in terms of tying it into your broader business goals, and ensuring it reinforces a positive brand and customer experience. Any audit will pick up on a host of small issues that can be quickly addressed. For example, are you using the right hashtags? Are you scheduling posts at the optimal time? Are you using links as well as you could? Sometimes the small tweaks can create immediate benefits. Identifying your best performing posts is a basic first step in creating improvements. You can see what works for you and why and put it to broader practice. It’s no secret that people trust recommendations from regular folks just like them and that word-of-mouth marketing helps humanize the brand and bring more credibility. It can be hard to get everyone at your company engaged on social during busy periods. When things slow down in the summer, it’s the perfect time to encourage everyone to join in online. Take advantage of the voices from built-in brand advocates who are ready to carry your organization’s message to an entirely new segment of potential customers. Employees can increase reach, traffic, brand awareness, and engagement by sharing content through company channels. These untapped spokespeople come with an inherent investment in the success of your company—all they need is a little guidance and encouragement. Spend time laying out the overall plan and goals of an advocacy program, educate your employees on how they can participate, and give them suggestions on what to say and do. Then, share the results when the project is complete to show what they were able to accomplish together. Instagram is a great platform to showcase company culture and provide a fun behind the scenes view of office life. Encourage employees to post fun photos from around the office or hanging out together. While it can be tempting to kick back and relax when business is slow, however, try to put lag time to good use by planning for when things pick-up again. Spend time building out your social content calendar. Plot out content for future events, even if you don’t know all the details you can still mock-up assets to finalize later. If you need some inspiration, look to current social media trends. Particularly checkout trends you haven’t had time to experiment with previously. For example, maybe you haven’t had the time to test out Instagram Stories. Leverage and experiment with Stories to add a new level of playfulness and visual storytelling. After you experiment with Instagram Stories, move to your content. Perhaps you’ve tested images or subject lines for performance, with the extra time afforded in summer, it’s a great time to expand your testing. Consider conversion testing landing pages. If your previous testing revealed preferences towards images or copy, build a landing page which highlights those pieces of content. Tools like Optimizely and Unbounce make it easy to set up variations of your landing page. You can test all variations of a customer’s journey, from tweaking CTA buttons to new content layouts. As with all testing, keep in mind the more elements you test, the more variables you will need to monitor. Where would your company be without the customers? Aside from helping maintain your bottom line, customers can provide a wealth of insights. Consider hosting an event for your customers where you can express your appreciation and have the opportunity to interact with your customers face to face. Depending on your budget, you don’t have to spend a lot of money to have a nice event for customers. You could have someone from your company give a presentation about upcoming product releases with a reception afterwards or host a good ol’ BBQ. Another opportunity to delight your customers and promote your brand is to send them branded swag. At Falcon.io, we love sending our customers surprise swag. If customers takes the time to give us positive shout outs on social media, we like to show our appreciation. When the sun is hot and social traffic is not, take the opportunity to improve your campaigns and plan for the future when you won’t have a moment to spare. Just because you’re working, doesn’t mean you can’t enjoy the sunshine. Charge up your laptop and soak in the sun to get the most out of the summer slowdown.